Since I focused on Hope Ranch Beach the other day, I am following up with a neighborhood focus to let you know more about Hope Ranch living. Hope Ranch is one of the prime districts of Santa Barbara, a sister neighborhood to high-end Montecito down the coast. On the map, Hope Ranch stretches from the beach through rolling oak-studded hills out to the freeway and the Upper State area of town. Many homes are Spanish style or colonial mansions, many have mountain views of the Santa Ynez Range, and quite a few homes have fantastic ocean views. 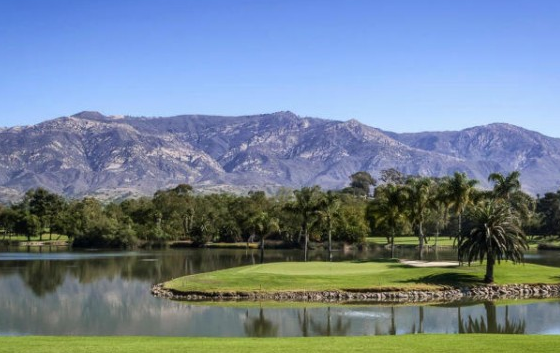 Hope Ranch is known for 1-5 acre parcels, equestrian trails, its private beach, its signature lake (surrounded by the links of La Cumbre Country Club’s course), and palm-lined Las Palmas Drive. Laguna Blanca School, a private college prep day school, hosts elementary through high school students. The public elementary school, Vieja Valley, also has a great reputation. In Hope Ranch, quiet, privacy, wealth, a casual lifestyle and a rural feel prevail. Prices, as you can see in the link for currently available properties, run from the $2 million range on up, with a current listing coming in over $15 million. Occasionally an estate near the beach will sell for even double that amount.